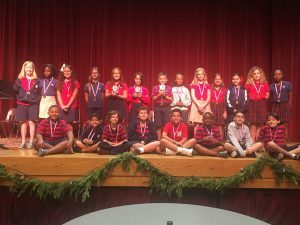 On Tuesday, December 4, the Lower School held the annual Scripps/Miami Herald 4th and 5th‐grade spelling bee. The students came well‐prepared and excited to show their spelling expertise. After 14 rounds of intense competition, Camilla Zayas‐Cruz (5th Grade) won the spelling bee. As a result, she will go on to represent Westminster Academy in the Miami Herald/Scripps National Spelling Bee in March. This win is the second in a row for Camilla who also placed first last year. Words spelled correctly and led to the final round were: “frippery,” “espionage,” and “flambeau.” Nicholas Sirois (4th Grade) won second place, and Avery Burton (5th Grade) won third place.